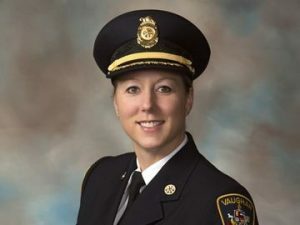 York grad and PhD student Deryn Rizzi has been appointed as the new Chief of Vaughan Fire and Rescue Service (VFRS), the first woman in the role. Rizzi is currently pursuing her PhD in Gender, Feminist and Women's Studies. She is a graduate of York's Master of Disaster and Emergency Management program, and has also taught the third-year course Comprehensive Emergency Management at York. Rizzi spoke to Matt Galloway on CBC’s Metro Morning to discuss her new role, and was asked if fire chief was a job she had always wanted. Rizzi acknowledges that being the first female fire chief in Vaughan is an opportunity to become a role model “not only to females, but to males,” she said. She spoke of how she rose through the ranks of fire service quite quickly, putting her in the public eye. At the end of the interview, Galloway asks Rizzi what she loves most about her job. Learn more about Chief Rizzi on the Vaughan website, in the Toronto Star and listen to the full interview on CBC.